The Ligue 1 side have made a disappointing start to the ongoing campaign and they are currently sitting fifth on the table after 16 games. 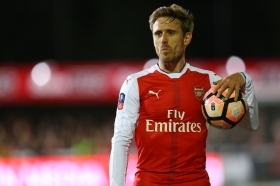 Owing to this, manager Rudi Garcia is keen on strengthening the squad to January to enhance the club's prospects of making the top-three and France Football suggests that Monreal is a leading target. The former Malaga man has just seven months remaining on his existing deal with the Gunners and so far, there has been no breakthrough over an extension. Monreal's fitness concerns have enabled Sead Kolasinac cement the role on the left side of the defence but it is still unsure whether the club would entertain a mid-season exit for the Spaniard. The Spain international has already shown his versatility of featuring in both the central defensive and left-back positions and Unai Emery may risk him for the season after Rob Holding's season-ending injury.